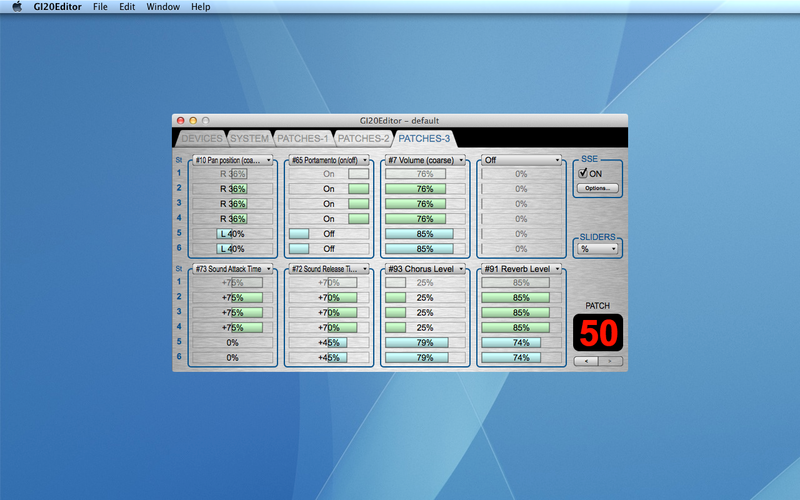 View and modify all system and patches parameters easily. Save complete GI-20 setups as documents, for backup purposes and fast switching between different configurations. Import or export GI-20 sysex dump files. Use copy, paste and swap commands to duplicate or exchange entire patches, or the “Paste Special” command to apply only selected groups of parameters, possibly extending them to all patches at once. Define midi system exclusive and bank/program change messages to be sent at patch selection to properly setup the target synthesizer. 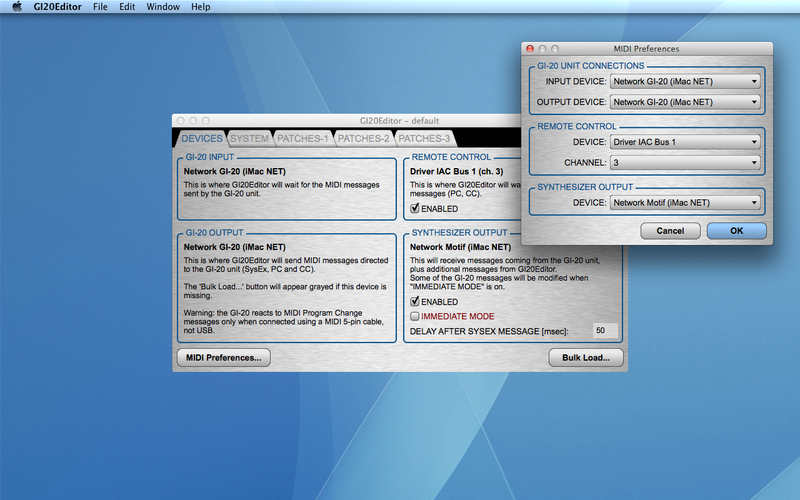 Send up to 8 midi control change messages per string per patch when a patch is selected or in real time. Drive a synthesizer that is not directly connected to the GI-20 unit without resorting to an additional midi routing application. Use on-the-fly substitution of GI-20 bank/program messages to instantly test different sounds without the need to upload changes to the GI-20 unit. Define up to 3 distinct strings groups and have a string parameter change automatically applied to all other strings in the same group. 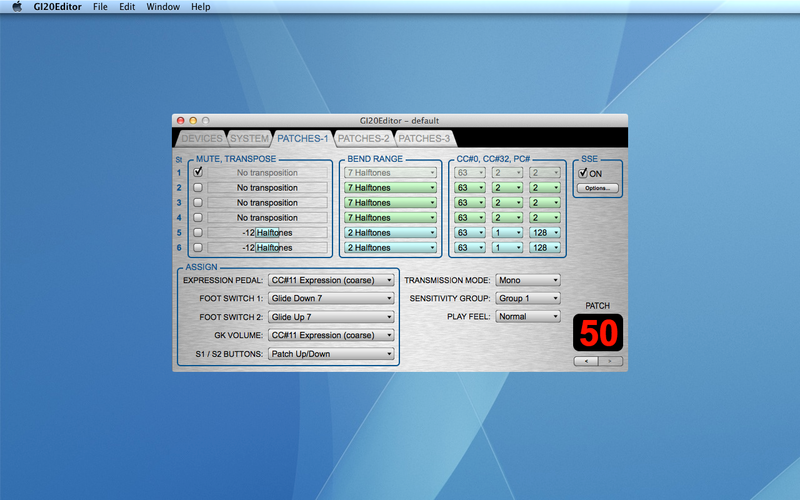 Select patches or transmit control change messages to the target synthesizer from an external midi controller. The latest OSX version is a 32/64-bit Intel fat binary that runs on 10.6.6 (Snow Leopard) and later versions. A comprehensive user manual is available. A DEMO version is available here. The demo version cannot save files. In addition, all MIDI output stops after a few minutes. The latest Windows version is a 32-bit application that runs on XP and later versions. It is distributed as shareware so, if you use it, you are required to make a donation of € 9.99 or $ 11.99 through the PayPal button below. Click here to see the terms of the license agreement under which the Windows version of the software is distributed. 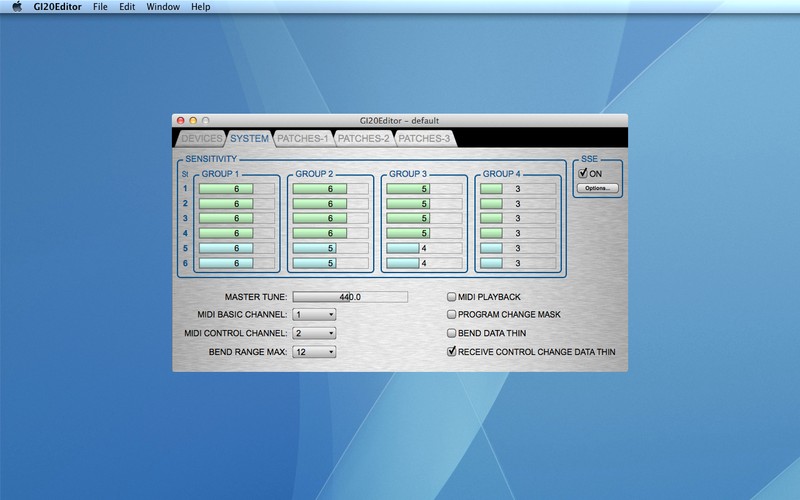 Up to 8 user defined MIDI Control Change messages for each string/channel for each patch can be sent to the "synthesizer output" device when a patch is selected or in real time. On-the-fly substitution of GI-20 bank/program messages, to allow rapid testing of different sounds without the need of a "bulk load". String grouping options for faster editing. Powerful "paste special" function to apply only selected changes, possibly extending them to all patches at once. Optional MIDI system exclusive and bank/program change messages sent at patch selection, to properly setup the synthesizer.